Does this disk make my collapse look brighter? Neutron stars have a theoretical upper limit to their mass. These objects are supported by neutron degeneracy pressure, but above a certain mass this pressure is no longer enough to support against the overwhelming crush of gravity. The implication: add enough mass to a neutron star and it will collapse to a black hole. There’s more than one way in which this collapse can occur, though. This paper focuses on two specific scenarios: collapse of neutron stars that have accretion disks and collapse of neutron stars that don’t. There are many different pictures in which a neutron star might be surrounded by an accretion disk. Some neutron stars could have an accretion disk of “fallback material” that re-accumulates after the initial explosion of the supernova that formed them, for example. And neutron stars in binary systems are often surrounded by accretion disks fed by matter overflowing the Roche lobe of their companion star. The authors in this paper aim to discover if there will be an observational difference between collapse scenarios with and without accretion disks surrounding the neutron stars. This type of collapse has been the main focus of numerical simulations in the past. In this scenario, a hypermassive neutron star (HMNS) — i.e., a neutron star greater than the mass able to be supported by neutron degeneracy pressure — suddenly becomes unstable and collapses into a black hole. This HMNS could come into existence as a result of a merger of two neutron stars, for example, and it would exist for only a fraction of a second. In the vacuum-collapse scenario there is no surrounding matter in an accretion disk, just a neutron star with a mass greater than the supported limit. Neutron stars surrounded by disks are continually increasing their mass with accreting material, but once the neutron star is fed beyond its upper limit, it will collapse into a black hole. This type of collapse has never before been simulated in full 3D general relativity — until now. The authors of this paper use Whisky, a 3D general-relativistic hydrodynamics and magnetohydrodynamics code, to evolve multiple initial setups of neutron stars with and without accretion disks through the point at which they collapse to become black holes. The authors then continue to monitor the black holes for a time after the collapse, in order to evaluate the expected electromagnetic and gravitational-wave signals. Time evolution of the density, beginning as a neutron star and ending as a black hole, in two simulations. 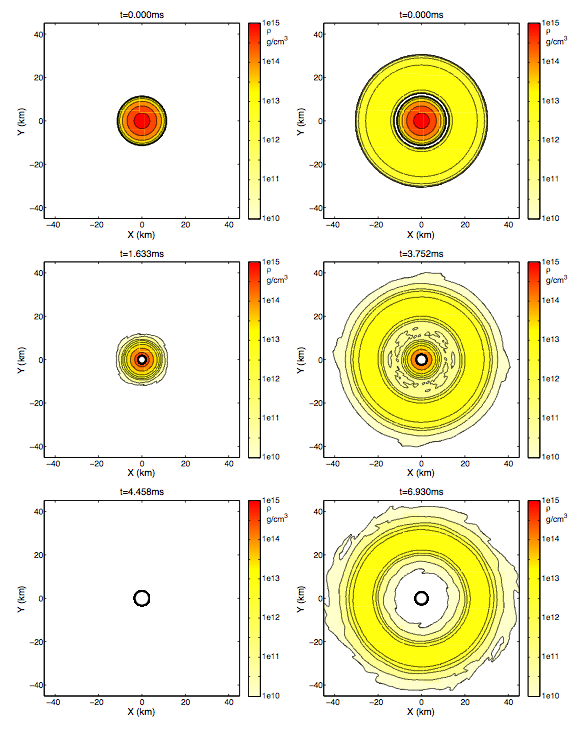 The left panels show scenario 1 (no initial accretion disk), the right panels scenario 2 (initial accretion disk). Top frame is the initial state, middle frame is the moment of collapse into a black hole, and bottom frame is the end of the simulation. 1) The gravitational wave signature for both scenarios are very similar, and too small to be detectable by current (or near-future) gravitational-wave detectors unless the sources are in our own galaxy. Gravitational waves therefore can’t be easily used as an observational signature to tell the difference between the collapse of neutron stars with and without accretion disks. 2) In the collapse in vacuum, all material goes into forming the black hole, leaving nothing outside the event horizon after the collapse. In the accretion-induced collapse, the mass in the accretion disk around the neutron star before the collapse remains in an accretion disk around the newly-formed black hole after the collapse (see figure). This means that after the collapse, active accretion continues in scenario 2, but not in scenario 1. Thus the electromagnetic signal — i.e., the luminosity of the object — can be used to tell the two scenarios apart. 3) In the accretion-induced collapse scenario, the authors find that the rate of accretion after collapse is roughly 10-2 M☉ s-1. This rate could produce a luminosity high enough to be consistent with observations of short gamma-ray bursts (GRBs), making this scenario a promising candidate for producing these GRBs. Did you mean the other way around– since in scenario 2 there is still an a accretion disk?